Excellent quality! It looks better in person than it was displayed on the website. 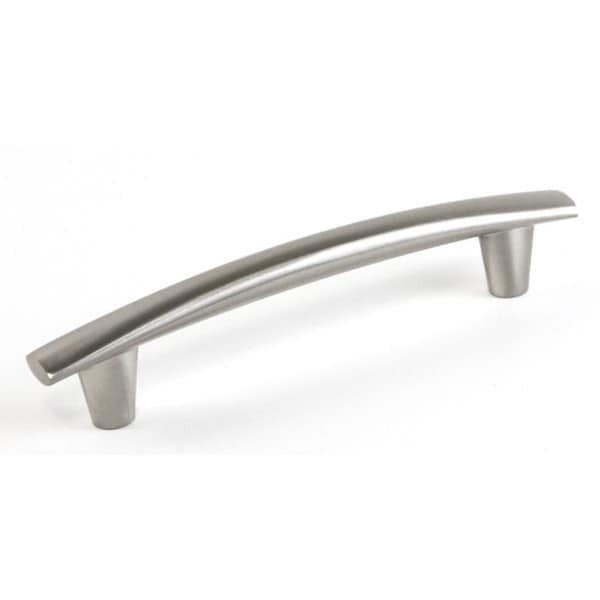 With a round arch modern design, this stylish pull is guaranteed to go well with modern bathroom and kitchen cabinets, but it can easily match other styles too. Made of high-quality zinc alloy, the handles are resistant to corrosion and color fading and have increased surface hardness, which makes them extra durable. These pulls look great on our contemporary cherry cabinets and accent the curved handles of our stainless steel fridge and stove. Tips: (1) If you need longer screws, use M4 metric machine screws with a truss or pan head. For some of my cabinets I had to use 40mm and 45mm lengths and some nylon spacers. In my part of the U.S. these parts are available at Lowes. Do not use standard #6 or #8 machine screws. (2) Be very careful about marking the mounting holes before drilling - for the pulls I used, there was some variation of the distance between the hole centerlines. Not enough to see once they were mounted, but enough to make very careful installation a must. These pulls are of very good quality and match the lines of the appliance handles in my kitchen. The screws that came with them could have been just an eighth of an inch longer for the thickness of my cabinet doors, but they work and seem sturdy enough. End result is a very nice look in my kitchen. These pulls are beautiful in my modern transition kitchen and bathroom. A great size and smooth on the hands. Some were scratched and missing screws. And the screws were too short. A couple even broke off in the pull rendering the pull unusable. The handles compliment all the kitchen appliance handles in our new kitchen. They look great on the cabinets. Very happy with the items purchased. High quality look superb. Used to update my old laundry cabinets. Also used to add to new kitchen cabinets. Gives a really cool updated look to whole area. Love, love, love. We remodel our kitchen and these handles look amazing on our white cabinets! Would highly recommend. Easy to install too! These handles definitely gave my brand new kitchen a boost. They are beautiful against my dark caninets. I just ordered more to put in the bathrooms. AND, happy to report, a friend of mine will be purchasing them as well. Modern, Stylish & yet Classy! Perfect size. Perfect finish. Perfect look for my kitchen remodel! Handles look very nice. They are lighter than anticipated but seem to be sturdy so far. These are really nicer then I thought when I ordered them. They are a good weight. "are these shiny stainless or more of a brushed stainless? My new appliances are a brushed stainless and I want to match them. Thanks. bonnie"
These are a brushed stainless steel & will match your appliances . "Hi The center heights is given as 3 1/2 ". That seems rather high, could someone actually measure that dimension please? Thanks "
"Could someone tell me if these are more a 'stainless steel' finish or a 'satin nickel' finish?" "How much does each handle weighs"
The shipping weight of the Contemporary Round Arch Design Stainless Steel Finish 6.5-inch Cabinet Bar Pull Handle (Pack of 10), is approximately 5 pounds. "Who is the maker of this handles? Thanks"
Hello Josefa R., we are unable to disclose the manufacturer of some of our products; however, Overstock.com stands behind every product we sell. When necessary we can contact suppliers if a product issue arises. Thank you for shopping with us. Painting my kitchen cabinets and these follow the same lines as the stainless appliance handles. Good match. Wife loved product. Same as we found at l;owes with lower price. "How many different sizes does this Cabinet Pull Handle come in? I need 3 different sizes." Hello jcwelke, here are all the sizes we have available. http://www.overstock.com/search?keywords=Contemporary+Round+Arch+Design+Stainless+Steel+Finish++Cabinet+Bar+Pull+Handle+&SearchType=Header Have a great day!